Eastern Sports Club agreed to be the programme partner of Higher Diploma in Sports Coaching and Leadership. They will assign professionals to be the programme advisor and provide internship opportunities for our students. Meanwhile, guest lectures and visits will be arranged during the term. Students will be placed for a minimum of 200-hour practicum. 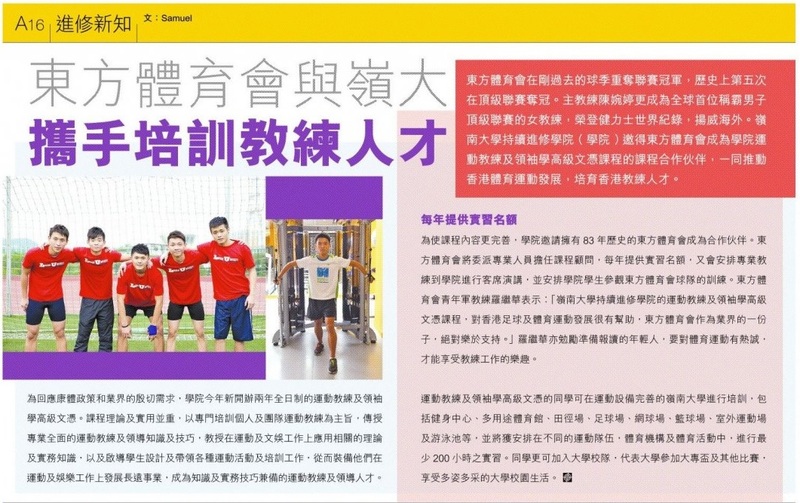 HKFYG Jockey Club Community Team Sports - Rope Skipping Demo Cup & Leadership Training Camp 2016-17, organized by The Hong Kong Federation of Youth Groups (HKFYG), was held on 9 July 2017. Students of Higher Diploma in Sports Coaching and Leadership were given an opportunity to assist in the event. Students were excited to gain experience in mega sports event management through participation in this event. Guangdong-Hong Kong-Macao Hydro-Fitness Competition & Integrative Performance 2017, organized by Physical Fitness Association of Hong Kong, China, was held at Shing Mun Valley Swimming Pool on 2 July 2017. Students of Higher Diploma in Sports Coaching and Leadership were given an opportunity to assist in the event. Students were excited to gain experience in mega sports event management through participation in this event. New World Springboard Swimming Championships was held on 1 July 2017. Students of Higher Diploma in Sports Coaching and Leadership were given an opportunity to assist in the event. Students were excited to gain experience in mega sports event management through participation in this event. Students were given an opportunity to assist in the event.